GUESTS of Lanson Place serviced apartments, who are used to the level of service by the group, will be pleased to know that it plans to triple the number of properties within the next three to five years. Lanson Place Hospitality Management Ltd, a Wing Tai Asia Group company, is also looking at representations in several new destinations like Vietnam, Indonesia, Taiwan, South Korea, Japan and Australia. This expansion will also see the number of rooms triple. 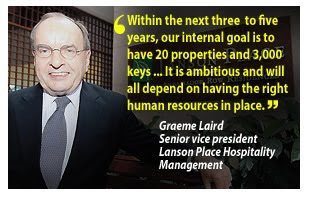 "Within the next three- to five- year period, our internal goal is to have 20 properties and 3,000 keys (apartment units)," the management company's senior vice president Graeme Laird said. "It is ambitious and will all depend on having the right human resources in place", he added. Lanson Place has a presence in Malaysia, Singapore, Hong Kong and China. In Malaysia, the properties are owned by Wing Tai Malaysia Bhd, which was previously known as DNP Holdings Bhd. Laird, during a recent visit to Kuala Lumpur from Hong Kong, told Business Times that the expansion could be pure management contracts for its group properties or for others or those where it takes equity. Lanson Place now has seven properties with a total of 1000 keys. Six of the properties are serviced apartments, while its sole property in Hong Kong is a hotel. According to Laird, the group is working on introducing two accommodation categories - a premier model that is likely to be called Lanson Place Residences and one which is a rung below, called the Lanson Place Apartments. The former will typically have 100 to 150 keys while the latter between 150 and 250 keys. Keys refer to the main door as serviced apartments can be a one-, two- or three-bedroom unit. Currently, Lanson's two top performing properties are located one each in Beijing and Shanghai in China. The first Lanson Place property commenced operations in 1998 in Singapore. Immediately thereafter, Lanson Place Kondominium No 8, a residential development, and Lanson Place Ambassador Row in Kuala Lumpur opened in the same year. When asked about competition, especially in Kuala Lumpur where there has been a mushrooming of serviced residences, Laird said: "Our product is different from our competitors. Our style and finishing is of high quality. And so is our standard of service." "You just have to arrive with a suitcase and be at home immediately," he said. It positions itself to go beyond expectations in service standards. If you are a guest from Lanson Place having dinner at a restaurant outside and it starts to pour, don't be surprised if a Lanson Place staff shows up at the restaurant's door just so he can hand over an umbrella to you.